An unassuming daisy, the Yam Daisy (Microseris lanceolata) or ‘Murnong’ as it is known by tuber hunting aborigines on the mainland, has a convoluted history. This makes it a subject of ecological and evolutionary interest to biologists. It’s closest relatives are found in western North America. Based on morphological and chromosome studies, the Yam Daisy probably came about by the hybridization of two American species followed by long distance dispersal – quite a distance I might add. So it goes that aborigines were eating foods of American origin way back. This marvelous feat of intercontinental dispersal has been confirmed more recently by studies using DNA extracted from the chloroplasts (cpDNA) of American and the Australian/New Zealand species of Microseris (Vijverberg et al. 1999). Since establishing in New Zealand or Australia, the Yam Daisy has diversified morphologically into 4 ecological types (ecotypes) – a coastal and fine pappus form in New Zealand and Tasmania, a lowland tuberous form on the mainland and south Australia, and an alpine form in southeast Australia. One would expect there to be great genetic differences between these morphologically distinct ecotypes. However, another study (Vijverberg et al. 2000) using a sophisticated molecular technique called Amplified Fragment Length Polymorphisms (AFLP) shows that on a molecular level, these four ecotypes of the Yam daisy show surprisingly little differentiation. 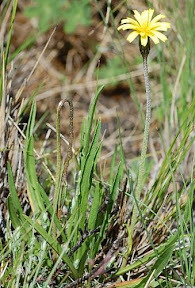 Simply put, the lesson that the Yam Daisy imparts is that looking different on the outside (morphological variation) as a result of environmental molding may have little to do what goes on inside (genetic differentiation). Could this be a metaphor for the human race as well? This entry was posted in Biogeography, Evolution and tagged Asteraceae, Microseris lanceolata, Murnong, Yam Daisy. Bookmark the permalink.